After the release of Mattel first handheld in 1977 turn out to be a huge success, many toy makers decided to jump on the bandwagon and created their own handheld. Atari which was the reference in video games at the time, decided to create a handheld that would revolutionize the industry, like the Atari VCS (2600) did for the home console market. The work on the Cosmos began in 1978. The task to create the Cosmos was given to Atari<‘s engineers Allan Alcorn, Harry Jenkins and Roger Hector. The idea behind the Cosmos was to use holographic images that would be lit-up by two lights inside the game shining on the hologram at different angles, and that would cause one of two images to light up. The screen was made of a small grid of LEDs (7 by 6). 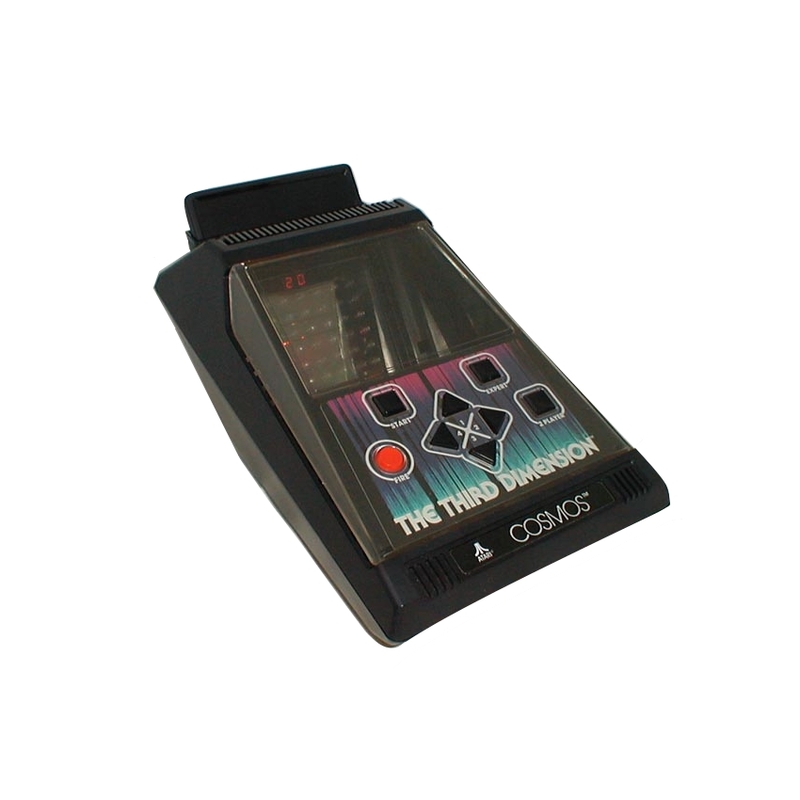 Although the Cosmos was cartridge-based, all games were built-in in the console. The cartridges only contained the holographic images and a notch to identify what game it was. This was obviously never advertised by Atari who wished to sell the cartridges separately. The Cosmos was set to be sold with the Space Invader cartridge included. The system was designed as a tabletop console powered by AC Adapter. The Cosmos would have supported up to 2 players. In 1981, the Cosmos was exhibited at the 1981 New York Toy Fair. Reviewers were extremely critical of the system, but Atari Inc. stood by it and managed to obtain 8,000 pre-orders at the show alone. Sadly, the Atari decided to pull the plug on the system before spending too much money on a product that felt doom to fail. Although the console was never released, some material survived. At least 6 units are known to exist, 3 are only empty shell mock-ups and the 3 other would be functional prototype, at least partially. In 2007, Dan Kramer, an ex-Atari employee, had started to auction both the Asteroid and Superman hologram that would have been used in the Cosmos cartridge. He started with 18 but have continued to release some over time. Some system’s boxes were also manufactured in very limited quantity. The system came in with 9 built-in games that could only be accessed with the correct cartridge. The cartridge contained no ROM, but instead would have notches that would tell the unit which game to start.